There I was in my game room, at the table with three friends, furrowing my brow and trying to figure out how on earth we could pull this off. The invaders had thoroughly taken over the island. We had actually run out of pieces to use for them, which the rulebook said was “highly unlikely”. I couldn’t do anything directly about it, because I was a spirit of nightmares and singularly good at terrifying the enemy. But we didn’t need terror, we needed them to die. I looked over at Orion who was playing a serpent of the deep. He was weak, but had been slowly absorbing our essences throughout the game in order to come out from his hibernation. We needed that strength reserve. Now. Orion did some calculations in his head–double, triple checking his work. The snake emerged from underneath the island, a vicious predator pushed too far by encroachment on its land. ‘In every land in the game: X Damage, where X is the number of presence tokens you have in and adjacent to that land’. It was a slaughter. As we carefully and methodically calculated the damage in every single land space I couldn’t help but grin and cackle. It wasn’t even my ability. But I was a part of it. We all were. Sacrifices we made earlier came to fruition and at the point of ultimate despair we figured out a solution. “Alexa, play ‘We Are The Champions’”. 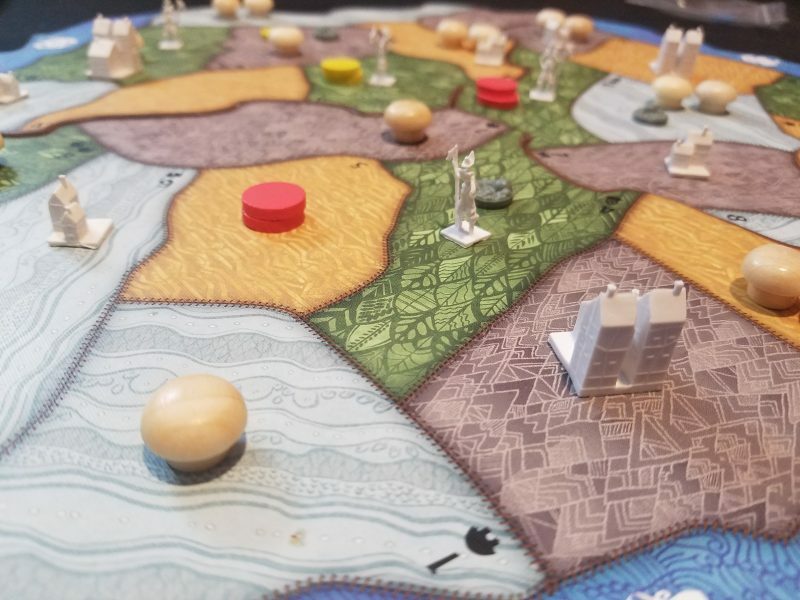 With a fresh and interesting anti-colonialist take on the eurogame genre, Spirit Island has 1-4 players take the role of spirits defending an island against colonial invaders. You can even specify which particular country is invading–the base game comes with three and they all shape the game in interesting ways. The invaders are like mosquitoes you’re trying to swat away, except they keep coming and coming and coming. Every round a new shipment arrives on one of the game’s 4 land types, and then they’ll start to build towns and cities, before finally ravaging the land, blighting it and destroying the natives. Indeed, the first few rounds of the game are specifically designed to seem hopeless, as you only have a couple of interesting, but largely under-powered cards in hand, and you’re only able to play one or two per turn. But from turn one that begins to change as you place more of your spirit’s presence on the island. When you put one of those discs down you reveal either additional energy (your currency for cardplays) or raise the maximum number of cards you can play on your turn. But even placing presence is part of a larger decision structure. The growth stage frequently gives you the option to place presence, but that may be only one option out of a couple–including getting new cards or putting your discard pile back in hand. I’m speaking rather vaguely here because each of the spirits in the game is profoundly asymmetrical, and each one of them is a joy to see and play. They have awesome names (see the chapter headings of this review) and look absolutely amazing. The art here is top notch and sometimes I’ll catch myself simply staring at the art of the cards instead of planning my next turn. So while one spirit may let you place presence and take a card in the growth phase, another might have more difficult, or simply unique, choices there. And while one spirit may grow linearly from 2, to 3, to 4 energy per turn as they reveal presence, and 1, to 2, to 3 cards played per turn, another might start at 0 energy income and have a maximum of 2, and another yet may end up with upwards of 8 energy per turn. Some may focus more on elements instead of pure energy to play cards. And that’s just the growth phase. After you make that decision the tough choices happen–what cards to play. You need to be able to afford them, you need to make sure they’re timely and relevant to the pressing matters at hand, and you need to coordinate them with your teammates. Also, elements. Each card you play gives you a certain number of elements out of the eight in the game. These are used to activate innate powers that you spirit has, and we’ve found them to be absolutely critical to success. The innate powers always come with three power levels as you accumulate more elements on any given turn, so when you acquire new cards you’ll need to be looking at not only the card text, but if it synchronizes with the elements you need. Or not, I’m not your boss. Many of the more powerful cards get even more powerful if you’re able to reach particular element thresholds. On top of that, each of the cards is either fast or slow–i.e. before or after the invaders do their dirty business, and each of them has a particular range from either your presence or a sacred site (2 of your presence), so board placement is important. Timing is important. Strategy is important. Coordination is important. It’s all important. But, because each spirit is so individually and uniquely itself, with its own powers, own abilities, and own strategies, you don’t feel quite so overwhelmed. If you’re a defensive spirit, it’s not your JOB to kill off invaders, only mitigate and counter their effects. The asymmetry is brilliant not only because it provides more flavor, but because it provides to you a heuristic framework to help focus your thoughts. The narrative arc in every game of Spirit Island is consistently delightful, because it’s designed to mirror the story I told at the top of this review. Granted, that was an exceptional example because “Serpent Slumbering Beneath The Island” is designed to create such dramatic moments with its ridiculous late-game power curve. But the game is precisely set up with a couple of push/pull levers that builds excitement directly into the narrative. As I mentioned before, everyone gets more powerful as the game progresses by increasing their energy income, card-play max, and presence on the board. There are a few ways you can go with that–trying to establish a wide net, concentrating on sacred sites for more powerful effects, getting lots of minor powers played, concentrating on utilizing an early major power, etc, etc. But inextricably you’re going to get more powerful and it feels great. However the invaders get a running start. They start out spread among the land, and then more arrive before you even have your first turn. But, of course, you’re not going to be able to do much your first turn, and then the people who arrived immediately start building towns and cities, and before you know it another wave has arrived, and they’re building, and then the first group starts ravaging. It’s intense, and even in the games where I’ve won handily I always feel a sense of terror in those first couple of rounds because they always start with the upper hand. But they do their invading, building, and ravaging mechanically, and once a particular land type comes up, you know they’re going to be building and ravaging in the next two turns. The key is to somehow find a way to dig yourself out of the hole you start in and intercept them in that process–destroying towns right after they’ve been built so they won’t do anything in the ravage step, or destroy the invaders as soon as they show up so they don’t build in the first place. But you need to do that while simultaneously dealing with the problems you’re facing right now. It’s a stressful, beautiful puzzle. But wait! There’s more. Soon the invaders will step up their game and not only invade in a particular land type each turn, but activate another (invading nation-specific) power on top of that. 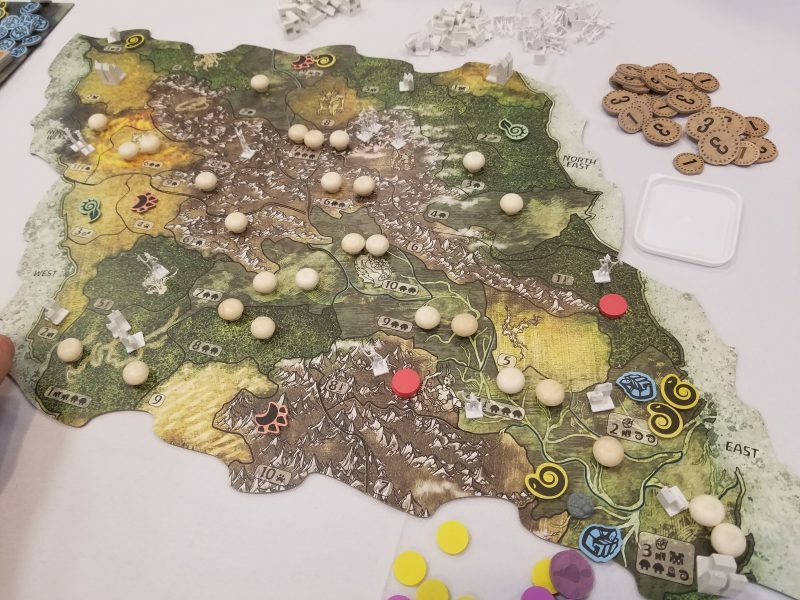 A couple rounds later and they’ll start invading, building, and ravaging in two land types each round–fully half the game board. You do not want to be struggling and behind when that kicks in! Oh, and guess what? Your win condition is to wipe them ALL off the map. At least it is to start. As you play certain cards and kill towns or cities you’ll be generating fear, and fear, as we all know, is the mind-killer. Each fear you create goes into a bucket, and once that bucket is full you get a fear card and start over again. The fear card is a small relief, a glimmer of hope in a terrible world. It activates a random one-time use ability before the invaders do their dirty work next round. More importantly, after you earn a couple of fear cards the victory condition of the game gets easier. Suddenly you don’t need to kill everything on the board, but only the cities and towns. After a few more cards it’s just the cities. Fear! Of course, the invaders have that nasty ravaging, which not only kills the natives (called Dahan), but also creates blight on the land. Blight will destroy your presence if you happen to be there when it drops, and if there’s already blight there it cascades, Pandemic-style, until it finds a land that isn’t already blighted. Even worse, once you place a certain number of blight tokens on the board the land becomes fully blighted and you get hit with an absolutely excruciating negative effect each turn–either losing a presence or a card every single round. That’s when the real panic sets in. All of this makes every game of Spirit Island tense and exciting with predictable, but no less interesting, twists of fate. You’re simultaneously getting better while they invade harder. They outpace you but you win in the long game through fear. It’s like game mechanism counterpoint where each point of tension is balanced against another point of relief. And while in some games this would make the experience either repetitive or railroad-y, you always feel like you’re in control in Spirit Island. Win or lose, it’s about how good you are at understanding the flow of the game and how to best play your spirit. You’d better be fine with losing because this game is hard. Make sure you follow the recommendations in the rules and play on difficulty level 0 for your first game because it takes a couple of plays to start understanding the rhythm of the game and how to best utilize powers. Even after nearly 10 games I find difficulty level 3 to be a challenge, and it goes up to level 10! I like to think I’m pretty good at these sorts of games too. Additionally there is a truly generous amount of setup variability included in the box. In addition to the three colonizing nations with their six different difficulty ratings, there are a handful of different scenarios that alter the game in meaningful and sometimes difficult ways, and the map tiles can be flipped over for a more difficult and more naturalistic looking map. Unfortunately, that map makes it very difficult to distinguish area borders so part of the difficulty is actually reading the map. This alone keeps me from utilizing this feature of the game, though the fact that the main boards are absolutely beautiful makes the choice easier. In fact, the entire game is beautifully produced. The board is vibrant and the pieces are both fitting to the overall aesthetic and easily distinguishable and readable. At a glance you will be able to tell the overall status of any given area, which is crucial. The small plastic men for the invaders are more structurally flimsy than I would like, but after a good number of plays I haven’t noticed any of them unable to stand up (yet). The wooden Dahan markers are particularly nice as they have an abstract yet distinct shape and the fact that they’re wooden makes them materially distinct from the enemies. Scythe did something similar with plastic and wood pieces and I think it’s a great move. The card art is equally stunning, particularly on the spirit-specific cards where they incorporate an image of that spirit within them to epic effect. 2017 was an impressive year for board game presentation with games like Sagrada and Fog of Love. Spirit Island absolutely belongs right beside them as one of the best looking games ever made. Complexity is a charge I’ve frequently seen levied against the game as a criticism, though I see it as a boon. The game isn’t necessarily that complex. It’s certainly a medium to medium-heavy game along the lines of Terra Mystica, but the rules are mostly intuitive and follow a logical order. The hard part, at first, is understanding the implications of what you can do and what you need to do given the pace of the game. The invaders move so quickly at first and you need to take losses in the early game and simply try to mitigate them as well as possible until you grow in power. Thinking two and three steps ahead is critical, and once an invader is set up to ravage next you’re probably too late to stop them. You need to understand the flow of the invader’s attack–explore, then building in those areas, then ravaging there. Left unmolested they will blight every land type of that color, so it’s better to stop them sooner rather than later. Understanding how to stop them before they’ve built can be difficult at first. Similarly, getting a hang of the iconography can be tricky, but that’s simply due to the amount of it rather than its clarity. If you’ve only played Pandemic before this is certainly a good step up in complexity, but I think the effort is absolutely worth it. That said, the first couple of games might be rough. Even then once you start upping the difficulty the new dynamics can seem impossible and force you into thinking about strategy in entirely new ways. I’ve spoken a few times about the quarterbacking problem in co-op games, and I think it’s a fascinating design problem to consider. I think Space Alert handles it best by imposing a time limit so that there’s simply not enough time to run the game single-handedly. Spirit Island has a similar solution, in that it creates such complex and tricky puzzles to solve that it would be quite difficult to optimise your own turn and other’s turns as well. I love this kind of soft solution to quarterbacking. The downside to this is that since this is a co-op game in which you will want to coordinate plans with others, it can be difficult to communicate possibilities without essentially reading out your whole hand of cards. But at worst I’ve seen this create kind of a collective AP (analysis paralysis) where everyone sits there with the knowledge they’ve gained through discussion trying to optimize everything. For a co-op that’s a good problem to have. Spirit Island has hooked me hard. I enjoyed it immensely at first, but as I kept playing, exploring new races and gradually trying higher difficulty levels, I found that I kept enjoying it more and more. Instead of becoming stale once you’ve started to optimize your strategies, Spirit Island simply gets better as it keeps pushing and pushing with more difficult challenges. It also pushes you into playing more thematically! The innate powers are so important that you have to try to get cards that sync with your elements, and those cards are designed to sync up with your spirit’s general play-style. It’s brilliant. 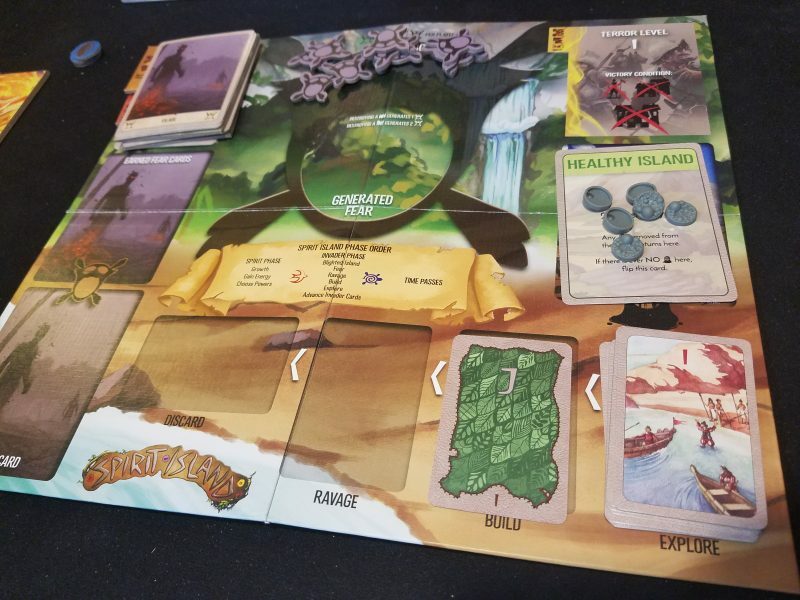 I cannot recommend Spirit Island highly enough. It’s the best example of a co-op Eurogame I’ve seen and, honestly, one of the best games I’ve ever played. I love looking at it, I love manipulating the pieces, I love thinking through the puzzle each turn and the strategic puzzle of how to develop my specific spirit each game. I love that feeling of overcoming defeat that, even though I know the game is specifically designed to create, still affects me each time. Somehow I keep thinking that *this* is finally the time we’re going to die horribly. 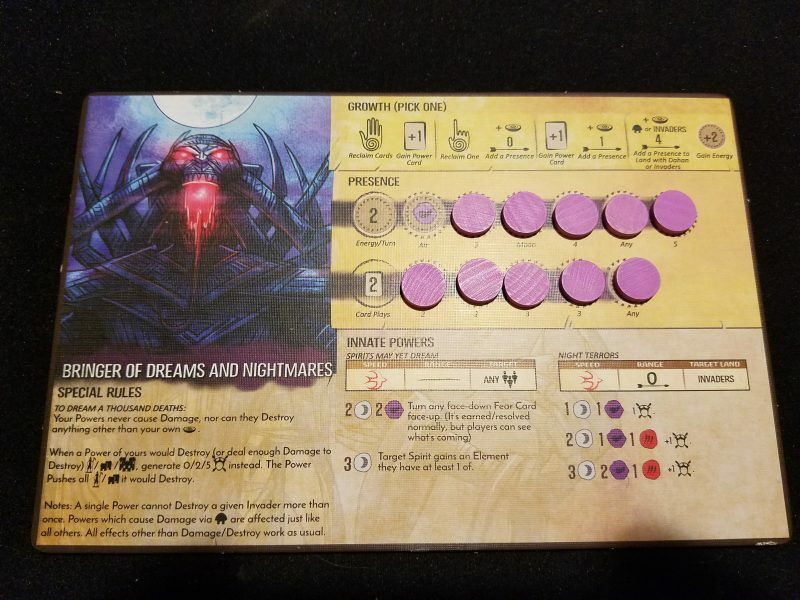 In a year without Gloomhaven this would almost certainly be a lock for game of the year. 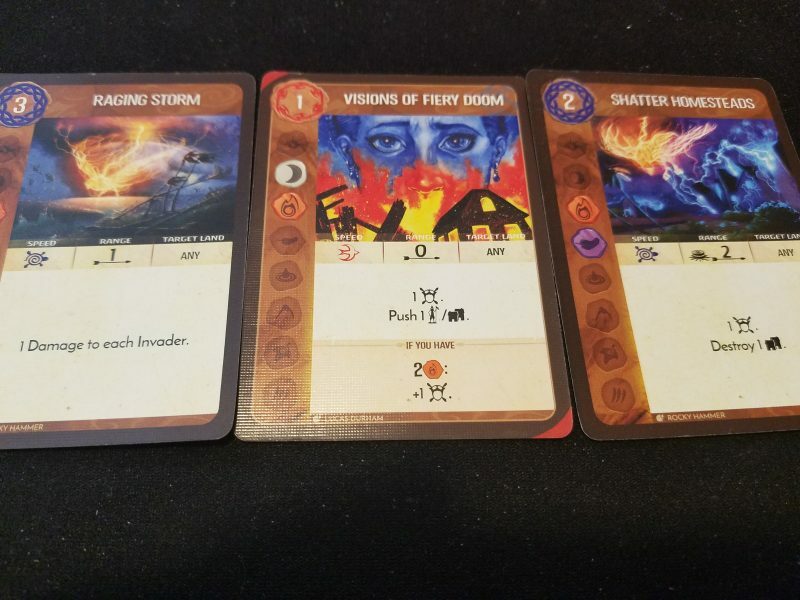 In a year that includes Gloomhaven…it still might be.